International Journal of Research in Health Sciences,2013,1,2,47-52. 1. Ph.D Scholar (Med. Physiology), Gian Sagar Medical College & Hospital, Patiala, Punjab, INDIA. 2. Assistant Professor, Department of Physiology, Gian Sagar Medical College & Hospital, Ramnagar, Patiala, Punjab, INDIA. 3. Professor & Head, Department of Physiology, Dr. S. N. Medical College,Jodhpur. 4. M.B.B.S, Junior Resident in Medicine Department, Gian Sagar Medical College &Hospital, Patiala,Punjab. INDIA. 5. MSc. (Med.Physiology), Certified in Fitness Nutrition, Punjab, INDIA. This study was undertaken in the Department of Physiology in collaboration with Department of Pathology, Dr.S.N. Medical College and Umaid Hospital, Jodhpur (Western Rajasthan), India during 2005 to 2006 to compare the severity and distribution of anemia among 500 Pregnant Women aged 18 to 35 years in urban and rural sectors of Western Rajasthan & its association with certain economic factors and religion. A multistage random sample design was used for the purpose of detailed study and World Health Organization (W.H.O) classification was used to define anemia. All the women consulting for the first time excluding those with prior pathology or regular use of medicines were included in the study. 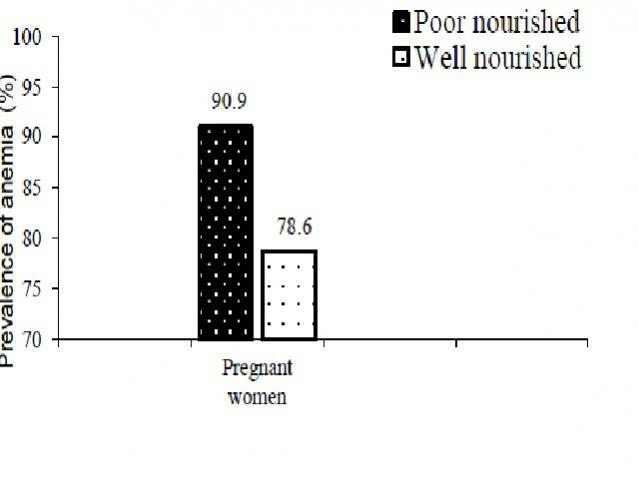 In this study anemia was highly prevalent 84% (n=500) in Pregnant women. 30-35 years age group women were most affected by anemia. The prevalence of anemia was much more in women belonging to Muslim community (92.3%) as compare to Non-Muslim (81.1%) because of less health awareness, extreme poverty, large family size & overcrowding leading to recurrent infection in this caste resulting into anemia. Multiparous pregnant women were found 100% anemic. We conclude that anemia is a significant problem of women. It needs new programme strategies, particularly those that control the large family size and improve the overall nutrition status of pregnant women. This will require tailored programs across the socio-economic groups and within both rural and urban areas, particularly among the urban and rural muslim .Problem of anemia is not difficult to treat but effort must be made to educate women and enhance their level of economic status and management of anemia must be dependent on the identification of the cause of anemia. All these measures would ensure safe motherhood.